The idea of the Mobius Strip—the infinity symbol that doubles back on itself—collided with my experience watching young ferrets play. Their wiggly chasing seemed like it could go on forever. These ideas combined with what I know of the extinction and resurrection of Colorado’s black-footed ferrets. Presto, the birth of a sculptural idea. 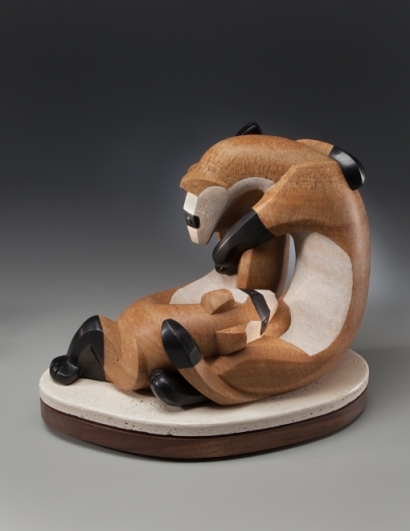 “Mobius Ferrets” illustrates my wish in a stone sculpture. The National Black-footed Ferret Conservation Center is located north of Fort Collins in Colorado. It is one of six facilities in the US with captive black-footed ferret breeding programs. Biologists breed and raise ferrets, and teach them how to live in the wild. They release them to prime prairie dog colonies. (Ferrets live in old prairie dog burrows and eat mainly prairie dogs.) Biologists then monitor their progress. The program has been a success and there are now about 300 ferrets living in the wild. Black-footed ferrets are still highly endangered, but they are on the road to recovery. Black-footed ferrets are members of the weasel family. They are the only ferrets native to North America. They lived in prairie dog colonies over much of the Great Plains in the US, Canada, and Mexico. Biologists believed black-footed ferrets to be extinct in the 1970’s. Ferret populations disappeared due to habitat loss, disease, and the eradication of prairie dogs. Biologists developed a captive breeding program at that time with the last remaining ferrets. Unfortunately the young ferrets died and the program failed. Then, in 1981, a dog discovered a small colony of ferrets in Wyoming. Disease wiped out this population. Fortunately biologists had taken 18 individuals from the colony before the disease struck, and this small number became the core of a new captive-breeding program. This time the program succeeded. Meanwhile, the sylvatic plague, deadly to both prairie dogs and ferrets, was working its way across the US from west to east. Fleas on rats from European or Asian ships probably introduced the plague to the west coast. Innovative biologists developed a vaccine against sylvatic plague. They administer the vaccine to prairie dogs in a crunchy kibble placed in burrows throughout the ferret/prairie dog colonies. Biologists have reintroduced black-footed ferrets to all suitable prairie dog colonies on public land. Now the US Fish and Wildlife Service is inviting private landowners to act as stewards for the prairie grasslands ecosystem and allow ferrets to be reintroduced to their huge acreage. Some ranchers have already agreed to allow ferrets on their property. They understand that responsibility to foster other species comes with ownership of vast tracts of land. Biologists are saving the short- and mid-grass prairie ecosystems and 130 other species of plants and animals that live there with the conservation/reintroduction of black-footed ferrets. It is a winning situation all the way around. It appears we are learning the importance of saving our natural heritage and beginning to understand the necessity for stewardship. This is a most encouraging accomplishment. Yes, we are progressing. May we have ferrets forever!